Summer was great. And fall was fun. But I'm so looking forward to snowy scenes and skiing and snowshoeing and ice skating and curling up under a blanket! It's going to snow a foot! The snowy death grip of winter has arrived early to crush us all! Everyone, quick, fortify yourself with bread, eggs, and milk! Look at the snow, it's so pretty and festive. Especially after all this spiked eggnog. I forgot how much I love skiing! And skating on the pond is magical! And the air feels so crisp and clear! And there's that wonderful moment during a snowstorm when everything is so soft and quiet! Winter is the best! A foot of snow? Bring it on! Shoveling is great exercise. Another foot of snow? 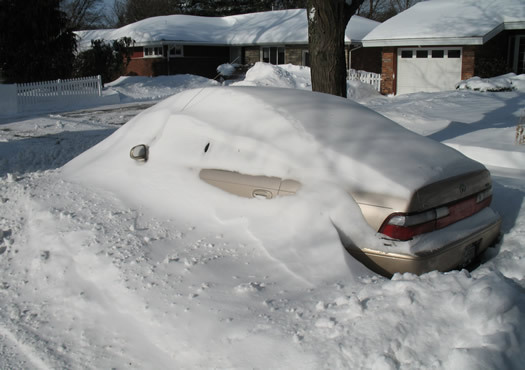 It took three hours to shovel out the car last time. Another foot of snow? A dusting. And it's going to be 25 on Wednesday? Heat wave. My long underwear has now become part of my body. It's fine. It's actually better this way. If it's not wrapped in dough, I'd rather not eat it. In fact, everything I eat must now be encased in some sort of carbohydrate. All of it. And, yes, I want more potatoes. Going to take a month-long nap. Wake me if the temperature rises above freezing. Actually, just let me sleep until May. I just... it's just... I can't even. This is how the world ends, isn't it? The universe just keeps expanding into the void, the light of distant stars recedes and fails, and all the heat dissipates. It will be cold forever. A foot and a half of snow, accompanied by an invading force of killer snowmen and mutant weaponized snow monkeys? Whatever, I'm done with winter. Remember the sunny days where you can just walk outside without a coat? And backyard tomatoes? And ice cream stands? And swimming? I'm going to move there. Hey, that's a large patch of grass. And I saw a guy wearing shorts. And is that... wait a second... HOLY !@#$%^! @#$, THAT MIGHT BE A CROCUS. GUYS, IT'S HAPPENING. SPRING MIGHT REALLY BE HAPPENING. Glorious mounds of snow, daily repeating swaths of deeper layers of your psychological failure to just freak out and leave for a tropical third world sanity of moving around in a different cultural people. Cast off your attachment to this suffering and migrate toward the equator. Sailing there would make it that much more satisfying. Or would it? Remember the moments of profound insight brought up by these unfamiliar prevalence of strange companions humorous as well as endearing. Accepting the whole of the world coming together for this eventuality and here i observe our vanity against the universe of indifference? No this will not stand! Engaging however reckless it is to Tango the volumptuous merit of being. Yeah that's a cartoon character. 39. That's how many more days there are until the first official day of spring. I may or may not have made a countdown for our fridge. But the days are longer, no?! I feel like you could totally turn this into a spoof song to the tune of the 12 Days of Christmas. Me, I'm at the crying stage. At least this winter we have lots of sunny days. In my memory, last winter was a ceaseless void of cloudy sub zero hell. And I'm feeding the birds this year, which gives me a little hobby. And I just realized that even if I did go south next year I'd still have to find somebody to shovel the sidewalk. Its the end of March that gets me depressed - even after the official beginning of spring we still deal with the cold, the occasional snow storm, and the ever present dirty dirt on everything. You forgot the drink until you forget it is winter and can't feel the cold phase. @Jessica R W: Heh. I remember thinking at the time we published this that if it appeared some place like Buzzfeed (or wherever) it would be a GIFicle. And so it is.